Ruhy Patel is a high school senior and the Student Body President at Central Bucks High School in Doylestown, Pennsylvania. Passionate about global relations and philanthropy, Ruhy is currently a Teen Advisor for Girl Up, a campaign of the United Nations Foundation that mobilizes girls in the US to raise awareness and funds to support some of the world’s hardest-to-reach adolescent girls. She is an active member of service initiatives on and off campus, and hopes to ultimately make a difference in the lives of young women as well as young men. Ruhy Patel: I am currently a senior at Central Bucks High School West in Doylestown, Pennsylvania. I have lived in the United States my whole life, but I’ve had the incredible opportunity to visit various places in the world and through that fostered my interest in the United Nations and international relations. Next year when I enter college I hope to study international relations, business economics and political science, and in four or five years I aspire to attend law school. In school I try my hardest to do the best I can because my education is very important to me and I value all the opportunities I get. I hope to one day be able to use my education to reach those who don’t get the same opportunities that I do. My parents and I like to joke that although I love running my day sport is leadership. In school I am an active member of service organizations such as Key Club, National Honor Society, Future Business Leaders of America and Student Government. I am currently the Student Body President for my school, which means that I get the chance to represent my school on the state level at Pennsylvania Association of Student Councils, and on the county level at our Bucks County Student Forum. These organizations helped to build a leadership training base for me where I learned leadership skills, people skills and gained a great deal of confidence in myself. Besides school involvement, I am very passionate about the communities I am a part of: the Doylestown community, the Pennsylvania community, the United States community and of course the global community. I was appointed as a Junior Councilperson for the Borough of Doylestown for the 2013-2014 term, during which I served as a voice for youth and learned the workings of local government. I am also an active volunteer in the Doylestown community where I am Apprentice at the Doylestown Historical Society and a volunteer at the Alchemy Open Art Studio – a therapeutic art studio that serves the public. In the broader community I intern for the Kevin Strouse Campaign and atGivology.org – online giving community that connects donors straight to education programs and individual students around the world. My involvement with my global community began when I was very young, a feat to which all credit goes to my parents. From childhood, I have always been exposed to any and all cultures my parents could tap into, from eating a new cuisine every two weeks to traveling to as many places as was financially possible. I got the chance to grow my interest to the way the world existed. As I developed understandings of the world, I began to focus on the policies in place and the issues each country faced. That’s when my interest for the United Nations truly sparked. I joined my county chapter of the United Nations Association the summer after 9th grade and began attending Youth Board Meetings the spring of 10thgrade (It was during 10th grade that I first heard about the Girl Up Campaign) I was soon appointed as a full time Board Member on the Bucks County UNA Board, where I currently serve. I’m very passionate about service and global policy and hope to one day make a difference in the lives of young women as well as young men. Women LEAD: You are a Teen Advisor and a member of your high school chapter of Girl Up, a UN Campaign with the vision of helping girls realize their opportunities to become healthy, safe, educated, counted, and empowered to be the next generation of leaders. What inspired you to get involved with Girl Up? Ruhy Patel: I heard about the Girl Up campaign during my first year working with the Bucks County UNA and I fell in love with the message. It is not often that students in the parts of America that I come from think about their education in the broad context of their lives, however it is important to know that not everyone gets an education. To me the message was clear: You are blessed with everything to reach your full potential, but not all children are. I have the chance to go to school, to pull myself up and to make for myself whatever path I see fit. It broke my heart to witness the girls’ struggles in the film Girl Rising – the 10×10 feature highlighting the lives of nine girls from nine countries. I made it my conviction to use my education to help those who don’t get that chance. One of the most vivid memories I can call to mind when explaining why I am so passionate about Girl Up’s cause is from my trips to India to visit family. I remember being little and packing for our long trips to see my grandmothers. We would run to Staples and fill half of our bags with school supplies. But only years later did it finally hit me that education truly is the ticket to a healthier, safer, and empowered life. I finally understood why when we gave them money, they didn’t smile nearly as much as when I handed them notebooks and pens and little lesson books. They understood the value of those simple tools a lot more that I had. If I were to describe my inspiration for getting involved with Girl Up in two words it would be: ‘Those children’. They have so much potential. Knowing that with the tools to become healthy, safe, educated, counted, and empowered young women they could truly change the world, I can’t ignore the chance to help. Women LEAD: What motivates you to continue fighting for girls’ education? Ruhy Patel: Motivation to fight for girls’ education, for me, lies in the reward of a better world. The idea that “A girl with an extra year of education can earn up to 20% more as an adult” is only one reason that we need to educate these young girls. Among rise in earnings, there is the classic argument that she will in turn invest in the economy of her country, provide better health care to herself and her family, and send her own children to school. The lack of education is still a significant issue facing our world today and if we were all to turn a blind eye; we would do our world a disservice. For me fighting for girls’ education ensures that I am at least trying to make a difference, as little or as big as it may be. I hope that by fighting I can send the message to those I know that it is an important cause and it requires attention. Ruhy Patel: Women’s empowerment matters for me because there is still a culture in today’s society that perpetuates so much stress on women from body image to social norms that they face self-esteem issues and often feel as though they can’t do what they want to. There are still more girls that don’t go to school than boys, and there are still more girls that suffer from diseases, child marriage, and poverty. By building a strong generation of leaders from the girls of the world we can help to change the face of the modern woman. Empowering women in America AND in around the world can truly build a foundation for a better future. We can add a whole new force and fresh perspective to every field or work, especially in policy-making. In our own country about 90% of lawmakers are male and the few females present often go without notice. These women are often judged more off of the content of their closet then the content of their speeches, perpetuating the social idea that it is okay to judge a woman thus. Only by empowering women to take stands and rise to more leadership positions in not only the policy-making fields but every field, we can make an impact on social constructs. Ruhy Patel: One woman that has impacted my life is my mother. She represents for me the roots and foundation for my independence. My mom, Sangita Patel, is a very hardworking individual that always has patience and a cool head. When she was about 16 years old she lost her father, and being the oldest daughter of four girls, she had to assume the role of a second parent. She was taught from a very young how to stand on her own two feet and learned the value of an education. Upon finishing her bachelors and masters, she married my father and moved to the United States, where they both struggled to keep my brother and me comfortable. I admire her go-getter attitude and the way she never seems to lose frustration. Some of the best words of advice I have heard have come from my mom and the most important thing she has said to me is to never give up and always push myself so that I could stand tall and be proud. My mother is the source of every bit of sunshine in my life and every joy, but she is also the strongest woman I know. I see her struggle under so much, yet achieve so high. Being a woman in the STEM field she is the only woman on her team, yet she works hard and performs at top level. Both the strength I have and the dedication to women’s empowerment come from a family tradition of strong women. Both of my grandmothers, my mom, and all of my aunts represent to me the importance of empowering women. I have taken so much from their life experiences and I hope to be able to pass on the legacy someday. Women LEAD: What advice do you have for current and future advocates for women and girls? Ruhy Patel: For current and future advocates for women and girls, I would simply say – Don’t let anyone tell you that you can’t do something. It is important that every advocate realizes that the true impact that she/he makes begins with herself (or himself. The problems are nowhere near fixed and it’ll be a long fight, but keep working at it! Overall, stay committed, don’t give up and believe in the power of one individual to make a difference. For all the young girls out there who believe that they are too young to get involved, I hope they understand that you are never too young to be strong and empowered! Get involved early and keep working until you get to where you want to be. Ruhy Patel: I tend to watch a lot of YouTube videos by various organizations that publicize issues related to education, gender equality and women’s empowerment. These videos are truly the best way to engage a listener and increase advocacy. 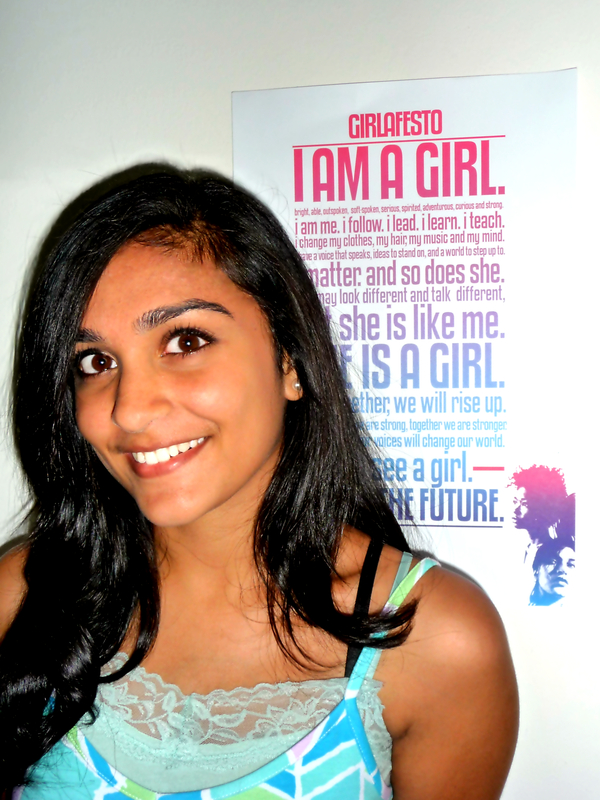 A few of the websites that I really enjoy visiting are of course GirlUp.org,http://www.girleffect.org/, and http://www.weprinciples.org. In terms of education and world issues, I regularly read the United Nations Association newsletters. There is a list of books and movies that Girl Up suggests to read and watch to build understanding about all three of those topics that I am currently working on that includes works such as I Am Malala (by Malala Yousafzi), A Thousand Splendid Suns (by Khaled Hosseini), and The Blue Sweater: Bridging the Gap Between the Rich and Poor in an Interconnected World (by Jacqueline Novogratz).